Look in the following publication and learn how to remove a paper jam in one Canon PIXMA MP280 printer. 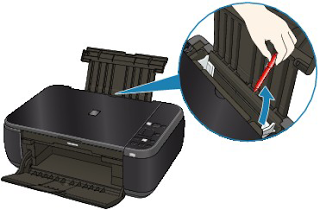 A paper jam Canon PIXMA MP280 printers can occur for many reasons, depending on how similar is the jam to these descriptions will raise then you must apply a solution. Follow all the steps as described to remove a paper jam Canon printers, always consult the documentation provided by the manufacturer. If you have had a jam plain paper like the paper has run before you leave and turn off the printer, remove the jammed paper and restart the printer, for it is recommended to press the stop / reset button so this resume or delete the printing process. If paper jams when it exits the paper, turn off the printer and remove the paper jam, it should slope to clear a jam must draw the pages slowly and firmly, doing their best to make this not break within the printer. Turn on the printer and try to reset the printer again. Check after removing the paper jam that it is not waste paper into the printer. If the top where the pages entering entered an object can be caused a paper jam do not let the pages pass the entire process can realize when normally jammed one side of the pages, and when we get the product stuck us realize that just in a corner something not let this happen. Other reasons that can a printer jammed paper is that the slots that position the pages are very close, we have to put these right in the position not bother pages to pass, ie other than such a paper jam. If the thick paper and the printer does not support it, will make a paper jam in the printer rollers. Check the thickness of paper documentation that supports your printer. Another factor that can make a paper jam is that the paper is thinner than that supports your printer, tear rolls happens that this type of paper and create a jam.